There’s a new Patreon level, in case anyone else wants to join in supporting the comic financially. For pledges of $15 or more, you get a signed copy of Kenan Malik’s monumental “The Quest for a Moral Compass: A global history of ethics”. Only five available! 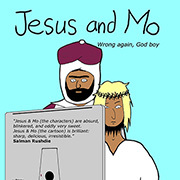 And here, for good measure, is Kenan’s Patreon page, where you can get signed copies of J&M strips. Using violence to proselytize, totally. It’s ok to believe stuff, so long as you don’t violate anyone’s fundamental rights. After all, what is true is simply what works. Eg, Euclidian geometry. It shouldn’t be served to minors either. That’s even worse. I was going to suggest “Burn Before Reading”, but some might take that the wrong way, so I won’t. I guess it all boils down to that pesky issue of definitions. Our wondrously informed Politicians exist in mutually dependent symbiosis with the Media and both will readily bandy about such words as Fundamentalist, Zealot, Fanatic and Radicalised without any apparent contextual awareness. Which is why to the devout, Fundamentalism is no aberration or perversion, it is merely the following of the teachings as taught and as such it is the highest virtue. Once you understand what the ‘message’ and the ‘means’ actually consist of you soon realise that, for anyone taking it as literally as devised, Islam is effectively self-radicalising. Those Theocratic Ninjas running amok in Syria and Iraq are Salafists and, irrespective of what any Infidel cares to believe, they are doing nothing more than meticulously following the actual words and deeds of their founder – to the letter ……. and the harsh reality is that every other Moslem knows it – be they Sonny or Cher! That many Western Muslims follow a more moderate path is more to do with dilution and minority than anything else (and such an eventually was catered for 1400 years ago)……. having achieved critical mass and the elimination of resistance Shari’a is inevitable. The only hope we in the West have for long term internal harmony is either: a) an upsurge in Apostasy or b) people such as Aayan Hirsi Ali and Majjid Narwaz gain sufficient traction for reformation to break the yoke of piety. Either way, we’re facing a pretty rocky road ahead. Reid – good points. Considering how long it took for the Enlightenment to “gain sufficient traction to…break the yoke of piety” in Christianity, no telling how long it will take for Islam. There’s definitely no easy cure for mass psychosis. Definitely hazardous to your mental health, same as every other “holy” book, including the holly buy-bull. I recently rented an hotel room and after paying for it I was sent the T&C’s which included the condition that I not use the room for ‘immoral purposes’. What does ‘immoral’ mean? What does ‘moderate’ mean? I like the Grauniad’s headline: “Everything is our fault”. Advice. Read the small print. Immoral is the opposite of moral, it means whatever you want it to mean. Inspiring speech by D. Cameron on the importance of weeding out the extremists from the moderates, in order to limit their influence on impressionable youth. Now here, in his train, come the on-the-fence ‘moderate’ Muslims, to demonstrate their best British abhorrence for mindless cruelty over their unfortunate but innate Koranic bias in favour of it, and to show they appreciate the depth of feeling in this matter, by once again publicly denouncing the extremism of ISIS and Boko Haram and Al-Qaida. And why wouldn’t they? After all, their brothers in spirit make them look like part of the most dangerous, cruel, misogynistic, and intractable biker gang in the world, so this is an easy sell. And they instinctively support Mr. Cameron because they know he can be bought off with some concerned-sounding announcements by self-styled community spokesmen, while Dr. Harriet Harman might want a quiet word about their attitude to women in general, and, you know, child marriage, FGM, burkas and honour killing in particular. It also doesn’t hurt that his politics mesh with theirs, if only in terms of maintaining a priestly caste in society that persists indefinitely, not because of any social benefit but through its own inflexible and cynical pursuit of power and self-interest (even the thin-milk responsible socialism of the modern ‘Labour’ Party frightens them with its impetuous modernism, with its origins in the heady future of the late 18th century). Indoctrinated as they are to be hostage to a school of thought that not only insists on its own perfection and immutability, but adds specific and extreme punishments for any attempt to drag it out of the ignorant, superstitious, gullible and irrational ethos in which it was formalised, religious Muslims attempting to articulate disagreement with literalist extremists are morally and semantically ‘painted into a corner’. With each desperate bleat they demonstrate that while the infidel Mr. Cameron can be humoured with the notion that of course some unspecified part of scripture must be in error, their own mullahs and imams cannot, and their hands-off extremist colleagues will keep killing, with whatever means are at their disposal, until their point is made. But prevaricate as they must, they know, from some tiny innate shred of conscience that one hopes cannot be disentangled from their Britishness, that so long as they fail to condemn, in terms specific enough to likely attract a death-sentence fatwa for heresy, the particularly medieval, no exceptions, kill-em-all-if they’re-different verses right there in the Koran that are the inspiration, moral justification and instruction manual for the most revolting barbarities extremism offers, they remain morally and politically complicit with the worst of their perpetrators, and will play no part in any solution to the problem. Euclid is so Old Testament these days. The New Testament, the Good Spiels of Lobachevsky, Gauss, Riemann and Bolyai, have surely replaced it for all forward-thinkers. Some dismiss them as nonsense but they are so far beyond nonsense that even C. L. Dodgson could not take them seriously and so logically must be sound examples for our following, even if we cannot see whither they lead. 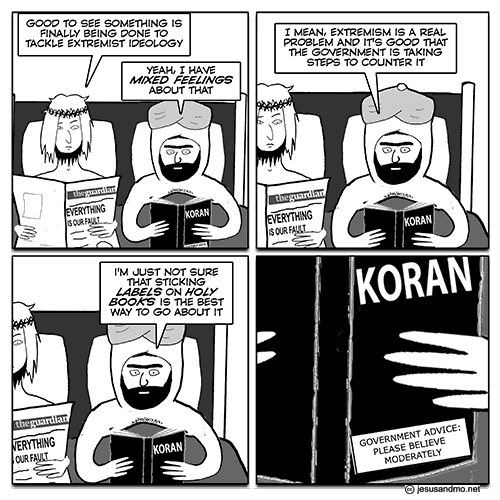 The one way out is the clever way Mo left the ‘satanic verses’ in the koran , giving a sharp minded/brave Imam a pathway to doctrinal enlightenment. Muslims are selfish and greedy just like everyone. The few who I have befriended paid no heed to their holy lore (perhaps secretly). So I hope the whole shebang will fall like cards or Franco’s Spain. As we have established the carrot (virgins) is a mirage; the stick is the problem but authoritarian regimes have not fared well. so I am hopeful, but we must not spread dispondency among ourselves as this will help the evil empire. Nice balance of put-down and complement there, and particularly welcome to be insulted in low-life jargon, by one of its most delinquescent and meretricious proponents. It seems that using ‘biker gang’ as a term of contempt was more to the point than I realised; even the moderates seem to be venomous. You’re giving extremism a bad name. Shame on you. No point putting labels on holy books. Most people won’t see the label because they don’t actually read those books. Bits and pieces of them to find justification for whatever they want to do perhaps, but not the entire book. To be fair the books *are* unreadable, the ones I am familiar with read like 1,000 unrelated essays written by 12 year olds. Check out a copy of “Eats, Shoots and Leaves” by Lynne Truss. You might be surprised, and we promise not to tell the other bikers. In 12 years of school I never learned of any underlying structure for grammar. It was just a mass of minutia to be memorized, a hodge-podge of rules, exceptions and arbitrary categories of words. “Eats, Shoots and Leaves” talks about the reasons for the rules. I was surprised to learn that there is a rationale for representing spoken English in print. Lynne Truss’ “Eats, Shoots and Leaves” is brilliant. I learnt more about the English language from that book that from all my years of school.